Mama’s Kitchen is a San Diego charity that provides free meals to adults and children affected by HIV/AIDS and cancer. As I do, they believe FOOD is LOVE. One of their biggest annual fundraisers also happens to be the biggest bake sale on the West Coast and features one of my favorite obsessions: pies! Each professionally baked pie you purchase provides over 8 healthy meals delivered to neighbors in need. This year Mama’s Kitchen delivered their 7 millionth meal. Seven million, can you believe it? Mama’s Kitchen started with one woman, cooking for her neighbors. The organization was founded in 1990 when volunteers from the AIDS Assistance Fund discovered that many of their clients were becoming too ill to take care of themselves. They realized that a reliable home meal delivery service was needed to ensure that these individuals would continue to receive nutritious, life-sustaining food. In 2004, Mama’s Pantry was opened to provide HIV/AIDS-positive individuals who are able to prepare meals the opportunity to supplement their nutritional needs. Today, the community-driven organization has expanded its service to San Diegans affected by AIDS or cancer that are vulnerable to hunger. Mama’s Kitchen provides three meals a day, for every day of the year, free of charge, to approximately 350 men, women, and children in San Diego County. Learn more and make a donation at www.mamaskitchen.org. 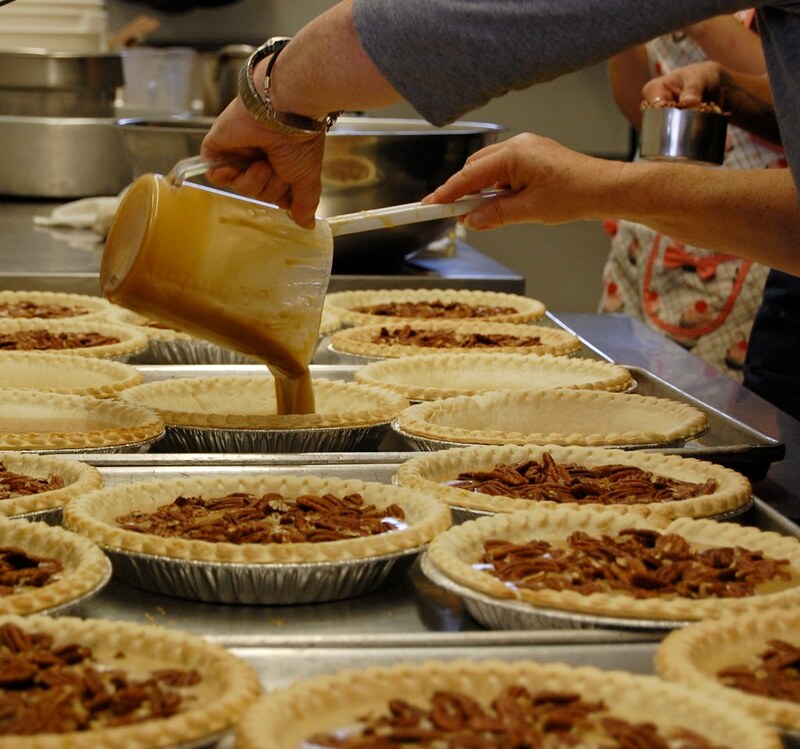 Mama’s Kitchen’s annual Pie in the Sky bake sale is one of their largest annual fundraisers. All proceeds directly fund thousands of free, hot and nutritious Mama’s Kitchen meals, which help ensure that no one living with AIDS or cancer will go hungry in the San Diego community. Hundreds of volunteers will take to the streets to sell the pies to friends, family and co-workers. Many of San Diego’s top pastry chefs, caterers, and bakeries such as Urban Solace, Sea and Smoke, Sycuan, Sea World, Behind the Scenes Catering and more will donate traditional Thanksgiving pies for this annual Mama’s Pie in the Sky Bake Sale. Pies will be available for pick-up the day before Thanksgiving on Wednesday, Nov. 27 at more than 20 convenient Wells Fargo Bank branch locations throughout San Diego County and at Mama’s Kitchen in City Heights. You can purchase a pie through my personal page, or set one up yourself. This entry was posted in Entertaining and tagged easy entertaining, good cause, pies, San Diego. Bookmark the permalink. We’ve participated in the past. This is such a great organization. I need to order pie, like NOW!